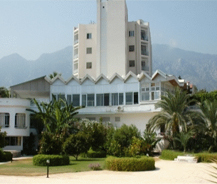 The Celebrity Hotel which is situated in North Cyprus of Kyrenia is famous for holiday trip and it has good reputation among everyone who visits this, as they are friendly and also their food and service makes the people to come again and again in every holidays. This hotel is situated at just 9 miles from the town Kyrenia and from here in a closer distance there are many local restaurants so that you can enjoy having different varieties of foods. This hotel is situated in the island of Mediterranean Sea and they built this mainly to make it as one of the finest hotels in the island. This hotel has a private beach which is mainly designed to enjoy privacy from other people and also for security. The beach has the facilities such as sun loungers and parasols. There are also sailing dingeys, wind surfers and water skiing which is available for hire at less cost. Also they arrange sightseeing trips for their visitors to enjoy the tour at free of cost. The rooms include satellite TV, mini bar, air conditioned, telephone lines both in rooms and bathroom, shower, balconies which gives you an opportunity to view the beautiful sceneries around the mountain and sea. Also it has 24 hour sport bar and casino where most people spend their time in the evening.